If you’ve read my recipe for jjin bbang, you know I’m a fiend for sweet red bean paste. 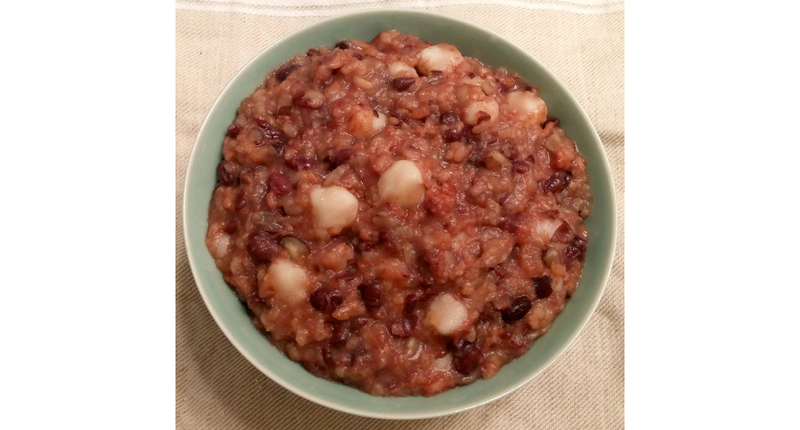 So, I had to include patjuk (red bean porridge) in my Korean Food Project. If you want to give your patjuk a more savory taste, you can add salt to it. Since I prefer my patjuk sweet, I add brown sugar or honey to it. *These beans aren’t large red beans, i.e., kidney beans. They’re small red beans, which are sometimes called adzuki beans. 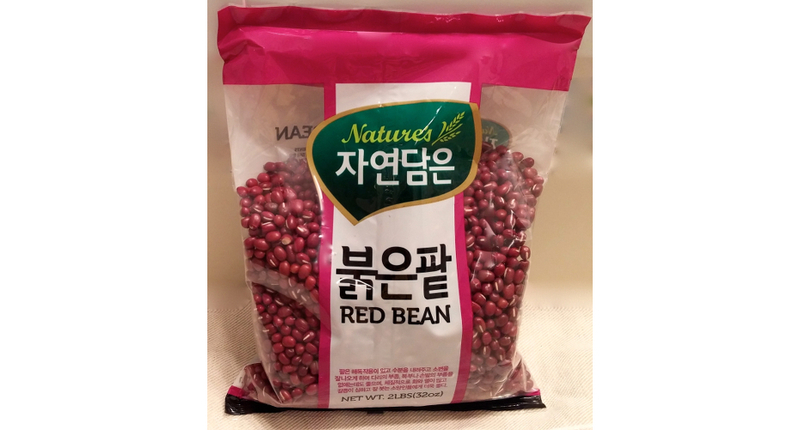 Above is a photo of adzuki beans in packaging. Also, you don’t need to soak this type of bean before cooking. Adzuki beans have hard shells, so they don’t absorb much water when soaking anyway. **Sticky rice powder is another name for rice flour and is also the same thing as “regular” rice powder. These powders/flours are all essentially pulverized rice. 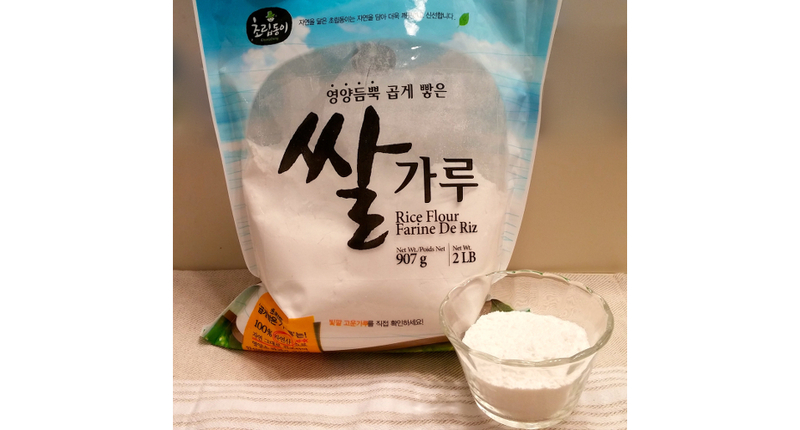 You can buy rice flour at Asian grocery stores or on Amazon.com for about $4. The photos above show a bag of rice flour and a small bowl of the flour itself, as well as the finished rice balls. Soak rice for about 30 minutes in water. Drain. Wash red beans, then drain. Bring a saucepan of water to a boil, add red beans and cook until soft; at least 30 minutes. Drain beans, reserving water. Mash beans with a fork or potato masher. Pour reserved bean water into a saucepan, add soaked rice and bring to a boil. Reduce to simmer and cook, covered, until soft, about 20 minutes. Meanwhile, make the rice balls by combining sticky rice powder, hot water and pinch of salt in a bowl. Using your hands, form mixture into marble-sized balls. Add rice balls to the water and cook until they rise to the surface, 1-2 minutes. 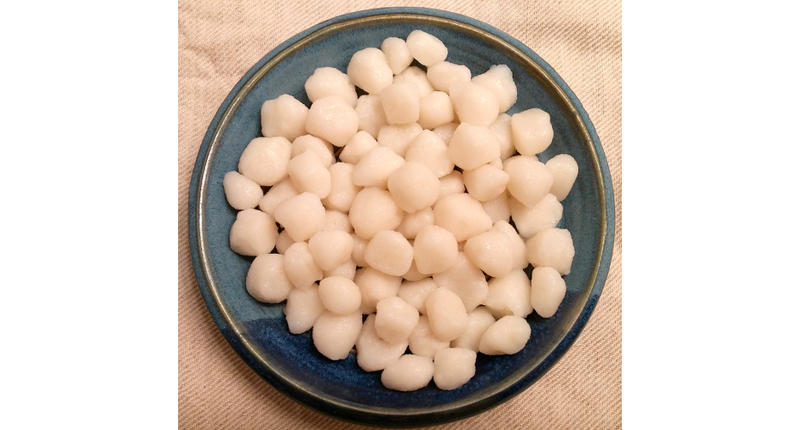 Remove rice balls from saucepan and rinse in cold water.